After an interesting season at the Covent Garden which has seen some pretty rare offerings--Agostino Steffani's Niobe, Regina di Tebe and Rimsky-Korsakov's The Tsar's Bride--alongside some impressively cast revivals of more standard fare--Macbeth and Madama Butterfly--the Royal Opera closes its 2010-11 season with perhaps what will prove its greatest triumph--a new production of Jules Massenet's enchanting fairy-tale opera Cendrillon, which actually remains pretty true to the original Perrault tale of Cinderella with which we are all familiar. It is beautifully staged by Laurent Pelly, the French director who seems to have just the right lightness of touch for this little-known French masterpiece. He it was who directed the knockout production of Donizetti's La Fille du Regiment here a few years ago, and has also been seen at the Met. 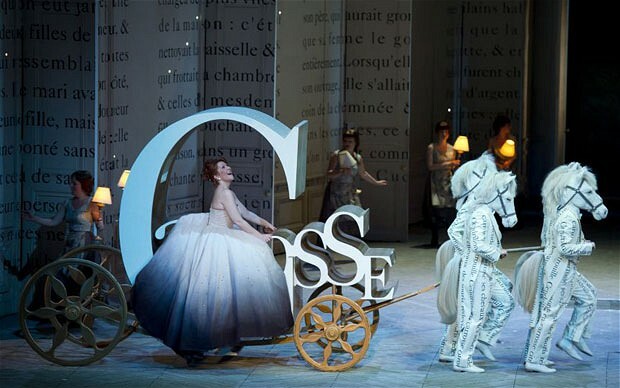 With stunning fairy-tale book designs by Barbara de Limburg and Pelly's own costume creations, this is the most delicious confection imaginable, and the fleet-fingered conducting of Bertrand de Billy is complemented by a first-rate cast. Indeed, the casting of the four main principal ladies' roles could not be bettered. In the title role Joyce DiDonato radiates innocent joyfulness at her change in fortunes, as she takes us on her melody-filled journey from rags to riches. The heart-stropping duets with Alice Coote's languid Prince Charmant are the work's vocal highlights, and it is unlikely that there will be many dry eyes in the house at these glorious moments. Coote, in particular, has done nothing better on the operatic stage, and here rightfully confirms her international status as a thrilling singer to be reckoned with. The voice is full and rich, and she perfectly captures the lovesick young Prince's melancholia. Ewa Podles, in her house debut, also demonstrates marvellous chest tones as Madame de la Haltiere, the domineering stepmother. The stage truly lights up with each of her appearances, clearly relished by an amused audience. Eglise Gutierrez is a glamorous Fairy Godmother, dressed for the catwalk, with glittering high coloratura to match as she weaves her magic over the rooftops where Cendrillon and her Prince meet in an imaginary world. Only Jean-Philippe Lafont's sympathetic father Pandolfe shows signs of vocal wear, but he etches a very touching character. I was entranced from beginning to end by this truly magical production - even though this was only the General (Dress rehearsal) - and wait with eager anticipation for the promised DVD. It does Massenet's neglected masterpiece proud.